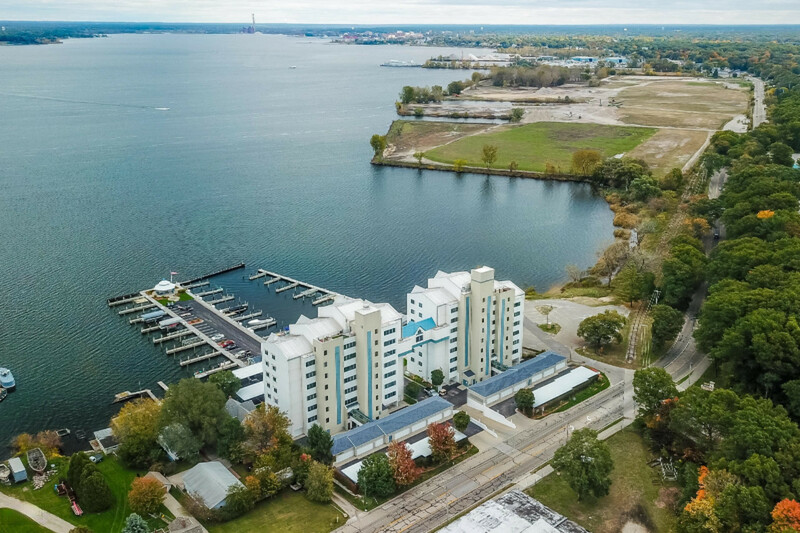 Fourth floor Balcom's Cove condo with captivating views of Muskegon Lake, complete with deeded 30' boat slip, garage space, dedicated carport, heated storage, and in-unit laundry room! This 2 BD, 2 full BA finely updated condo provides its own versatile floor plan and includes, quartz counters, glass subway backsplash, cottage white kitchen cabinets and more! Waterside master includes large WIC, deluxe private bath and private access to the open-air covered balcony! Condo dues include: heat, water/sewer, snow removal, lawn care, trash, and marina and common area maintenance! Enjoy easy access to the Lakeshore Bike Trail or Muskegon Country Club - both directly across the street. Sugarsand Lake MI beaches and lakeshore attractions within minutes! See plan and attached documents for details!